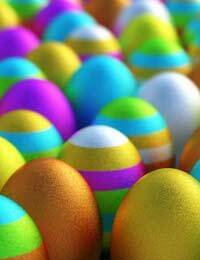 Easter time brings with it a great sense of renewal, a sense of things to come and things to look forward to. Easter coincides with spring, when it seems nature is bursting into life. It's only natural then that many of us want to mark this occasion - for religious purposes or otherwise - by decorating our homes to reflect the world outside. This article looks at ways to make your own Easter decorations. You needn't spend a fortune, and it's also a great way to encourage some family fun by getting children to participate in a craft. This sort of interaction with Easter crafts can help to tell the story and meaning behind the Christian Easter celebration, as well as Easter's other non-religious associated traditions, such as the Easter bunny. You can easily make your own decorative Easter eggs, and will probably find that it's a huge hit with kids too. The eggs can be used to adorn table decorations, or strung up and hung from an Easter tree. A bonus is that many of the materials used in these Easter decorations can be sourced for free. To make your decorative Easter eggs, you'll need a few things to hand. Firstly, of course you'll need some large free range eggs. You'll also need a plastic drinking straw or syringe (no needle! ), and a long sewing needle. Of course, you'll need to 'blow' your eggs, meaning that you'll need to remove the egg white and egg yolk whilst keeping the shell in tact. To do this, a hole should be made in the pointy end of the egg using a large needle. The hole only need be a few millimetres wide. Once the hole has been made, the yolk and egg white will need to be broken up by poking a long needle inside and agitating the yolk. Another hole should then be made in the other end of the egg. Because you'll be working with raw eggs, salmonella is a small but apparent risk, so gone are the days when you would simply press your lips to the egg and blow out the contents! The alternative is to use a syringe (usually a bulb syringe will suffice) to blow air or water into the egg, pushing out the egg contents. Although this takes longer, it's deemed safe, and will also save you the hassle and strain of continually bending over a sink. The eggshells can then be bake dried in an oven for about 10 minutes at 150C (300F) or Gas Mark 2. They are now ready for decoration! There are several different ways to decorate an Easter egg - if you have enough eggs, why not try them all?! If you want to hang your eggs from your Easter tree, you'll simply need to thread and loop string or ribbon through both egg holes and then knot underneath. The first method is simply using acrylic paints directly onto the eggshell. You can design patterns and motifs, or if you're particularly artistically adept, you could always opt for a small image or Easter scene. Another option is to marble the eggshells. One popular method is using red or brown onion skins. Brown onion skins in particular will create an attractive and elegant marbled effect. Simply delicately wrap the eggshell in onion skins, and place in boiling water for a few minutes. Then remove the egg, take off the onion skins and leave the shell to dry. You'll be amazed at the results! Candle wax can also be dripped onto the eggs to create interesting patterns and effects. The egg can either be left as is, or rolled in food colouring to produce a batik-like effect. A slightly obscure alternative is to cut out small images and stick them to your eggs using PVA glue. You could make your own tiny mosaic eggs, or collage different images and layer onto the egg. When sticking each paper image, dab with a damp cloth to help the image stay put. To finish, paste over with a very light coat of PVA glue.